I am looking for a new or used vehicle for somewhat demanding conditions. I am open to all suggestions, but I have a list of specific needs. It needs to have AWD/4WD. It has to be capable in the fairly deep snow (around 8 inches to a foot). It needs to be reliable, I am driving it from Massachusetts to Nova Scotia two or three times a year. I'd like it to have room for a couple of suitcases, a computer and a backpack. And lastly, I would like to have a fairly quiet interior for the long highway stints, with comfortable seats. The old Landcruiser wagons were a fantastic vehicle, with that clone of the Hino 3.5 litre 4-cyl. diesel found in all the 3 ton delivery trucks. (Toyota later purchased Hino outright). But they disappeared in the later 1980s ... probably older than you're interested in. Of course, if you're driving in a snow and concerned about safety, then a car is the better choice, as most highway deaths in the USA are from roll-overs and most roll-over accidents are SUVs. If you're on a budget (under $10k), an older Audi All-Road would fit the bill, and they're an insanely comfortable highway cruiser. There's a dial on the dash to adjust the height of the air suspension, and a button that gives it a temporory extra lift boost if you get high-sided off-road. But, the Audi V6 engines were notoriously expensive for timing-belt changes. And needed the best oil to last. A half-million miles on engine and turbos is common with the right oil, but owners chince out and ... well cheap oil and turbo-chargers don't mix. At least not for long. If you're OK With an SUV then look at the older Benz M-Class. They are a body-on-frame construction, built for the worst off-road conditions, but with good on-road manners and supreme comfort. The diesels go for over. The V6 is great too (in the ML-320) though will cost more in fuel. Both models need minimal maintenance. If you want a BMW then the X5 is good. It will cost more to maintain than an M-Class or Land Cruiser. And, like anything from BMW, run away if you see more than 6 spark-plugs under the hood. Unless to REALLY like to spend a lot of money on a regular basis. With more of a budget, the Audi Q5 TDI is the ultimate vehicle for your usage. Fuel consumption of a compact car, it has surprisingly great handling for a car that's raised up as it is. Handles a lot like an A4 in fact. (possibly due to the fact that it is based on the A4). The negative about them is that they are so desirable that the used ones command a higher price than other vehicles of similar age and mileage. Back to cars, the Volvo Cross Country is another great one, though the turbo-charged Volvos are comparitively thirsty. Not thirsty like a RAM Hemi-quad-cab. But compared to an Audi wagon they are thirsty. Mercedes doesn't have much to offer, except the E-Class 4-matic wagon, which is extremely rare. However, the GLK is a great small option, and with the diesel its fantastically efficient. The Acura MDX is another consideration, though none of the Japanese (other than the land cruiser) match the ruggedness for real off-road (or bad pot-holed streets) like the German cars. Wow, that was a very indepth responce! I really appreciate it, I will look in to a few of those. I can not recommend the Land Cruiser strongly enough. I have owned three, series 62, series 100 series 200. 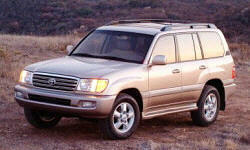 I have also owned a Lexus GX and a Toyota 4-runner. The Lexus Gx was the weak sister of the group. I won't go into the problems with the GX, but I will tell you of the strenghts of the LC. 100K miles and I replaced only the tires and a intake manifold. Zero issues. Reliability beyond belief. If it were not for the lockout hubs I would have held onto it. The series 100 anothe totally reliable vehicle. Sold it at 125k miles while I never, never had a malfunction or maintainence issue with the vehicle. No repairs of any kind. The vehicle only received standard maintenance and a set of tires at 68K miles. The series 200 currently has less than 15K miles and seems to be in the mold of the !00 series. Its KDSS , kenetic dynamic suspension system is in a class of its own. Outstanding stability with car like performance on the highway. Off road (think snow too) the combinations of gearing and terrain selections will keep the vehicle going and going and going. If budget is important look for a used 100 series or early 200. They are worth a national search and rescue effort. A newer Chevy Tahoe could do what most of those listed but be super quiet and comfortable all while getting the best fuel economy. The Tahoe has been going the distance of over 300,000 miles and not rusting out.